Beaulieu recently signed a new book deal with Daw Books, but he was forced to part ways with Night Shade Books at about the same time. 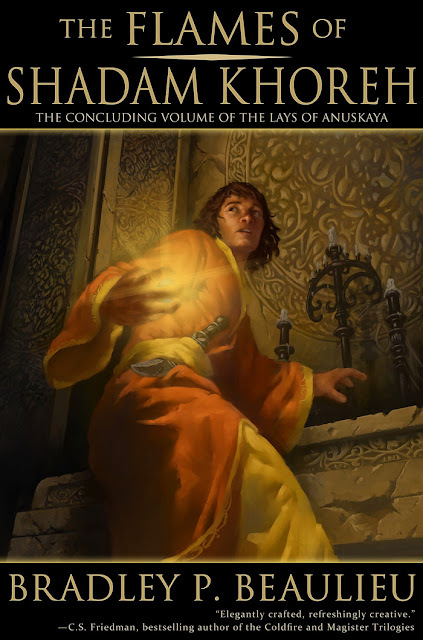 As you know, I've been a big fan of The Lays of Anuskaya, which is why I'm happy to help spread the word about a new Kickstarter project aiming to bring the final volume in the series, The Flames of Shadam Khoreh, to life and in the hands of readers everywhere! Welcome to the Kickstarter for The Flames of Shadam Khoreh, the concluding volume in The Lays of Anuskaya trilogy. "If Anton Chekhov had thought to stage The Three Sisters onboard a windship, with a mix of Arabian Nights and Minority Report thrown in for good measure, the result would have been Bradley Beaulieu’s The Winds of Khalakovo—a startling combination of fantastic elements which seems at once both comfortably familiar and refreshingly new. It’s a wild ride well worth taking, and an exceptional debut from an author who takes risks and consistently delivers." In many ways, this is a Kickstarter for all three books in The Lays of Anuskaya trilogy. The first two books in the series, The Winds of Khalakovo and The Straits of Galahesh, were published by Night Shade Books in 2011 and 2012. Due to a variety of reasons, I have parted ways with the publisher. After the very positive experience with my first Kickstarter for my premiere short story collection, Lest Our Passage Be Forgotten & Other Stories, I knew that I could follow in the footsteps of giants like Terry Goodkind and Brandon Sanderson and get this book out directly to the fans of this series. I'm very excited to bring this book to readers like you, those who love epic fantasy with a grand, sweeping scope, a complex plot filled with politics and betrayal, and characters that remain with you well beyond the turning of the page. I invite you to watch the video, to look through the reward levels, and see if there's something there for you. If not, I still hope that you'll spread the news around for this Kickstarter. Even if it's not for you, your friends and family may really enjoy it. Thanks for looking, and if you decide to take the plunge, you have my heartfelt thanks. I won't let you down. Believe me, the series really ended with a bang. I'm eager to read this final installment! Support the project if you enjoyed The Winds of Khalakovo and The Straits of Galahesh! This author is terrible at book titles. Done! Cheers for bringing this up Pat!